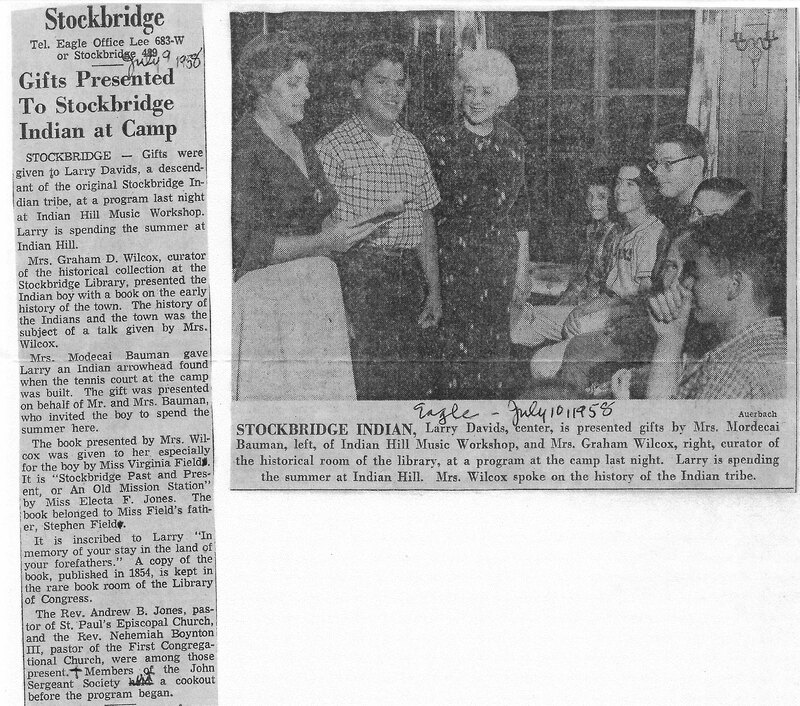 In doing some research at the Stockbridge Library, my brother came across an article (reproduced below) that appeared in the Berkshire Eagle in 1958, five years after the events he described in his recent article. A related picture appeared the next day. Notice the phone numbers given. I think dial phones came to Stockbridge in 1960. When they did, every number in town belonged to a single exchange, so in order to dial a number within Stockbridge, it was only necessary to dial the last four digits. Our number on South Lee Road was 3557. That replaced our old number of 246-J. The “J” indicated it was a party line, and we would answer only if we heard the correct number of rings. Prior to dial phones, an operator directed the calls. As a small child, I lived on Park Street, where our number was 266. One day, when I came home from school, my mother was not around. I’m not sure that had ever happened before, and I didn’t quite know what to do. In those days, she worked at the church from time to time (she was the church secretary), and I decided to call there to see if she was there. I had not used the phone very much, but I did know that if you picked up the receiver, the voice of the operator would say, “Number, please” and you could tell her who you wanted to call. I didn’t know the number of the church, but I figured she would. So I picked up the phone, and instead of what I expected, I heard “Operator” — I was dumbstruck, not knowing how to respond. What did she mean? Being flustered, I just hung up the receiver. I thought about it for a minute, and decided to try again. It had probably been a mistake, and if I tried again, I would get the expected “Number, please.” So I picked up the phone again, and again I heard “Operator.” Now I was totally at a loss, so I just stood there with my mouth open, not knowing what to say. “Hello, can I help you?” I heard coming from the phone. Oh, yes, that was something I understood. “I want to call my mother at the church,” I said. That is my earliest memory of being flummoxed by the disembodied voices that flow out of telephones. I have never been comfortable speaking on the phone, and to this day I pretty much don’t. The grandmother just mentioned appears in the photograph below. I am seated in the front row, wearing my Little League uniform. I must have arrived from a game. I am sitting between Bob Chassell, on my right, and Dan Rinsma, two good friends of mine from those long-ago days. Many stories for another day. The handwriting on the Eagle clippings is clearly recognizable as my grandmother’s. Oh my Lord Mike..This brings back memories. I moved to Stockbridge in 1960..Of course you, bob and Dan were all friends ..My phone number was 3218. Later it was 298-3218.
inally passed away this past year. He was into his 90’s. Yes, Dale, I remember your phone number. My discomfort with speaking on the phone persisted into those high school days, and, in fact, for the rest of my life, and is still with me today. Many stories could be told around that theme, but one that involved you, which you may not even be aware of, was the time I walked from my house on South Lee Road to your house in Larrywaug (a good 3 miles or more). I guess it must have been a Saturday and I didn’t have anything to do, so wanted to see if you were up for something. When I arrived at your house, your father seemed a bit surprised to see me. I asked if you were home, and he said, no, you had gone to the movies with David Drake. I thanked him, and turned around to head home, and he called out to me, “Did you walk here?” Yes, I said, and he asked me if I wouldn’t like a ride home. No, I told him, I was fine with just walking home. “Oh, come on!” he insisted, “I have an errand to run in town; I could do it now, and drop you off at your house.” Okay, I told him, although I had the feeling he had invented that story. He was always very nice to me.